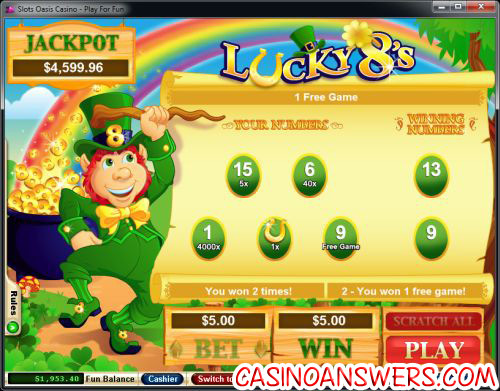 Lucky 8s Scratch Card Guide & Review - Casino Answers! The Lucky 8 Scratch Cards are the type of scratch cards that you’ll either love or hate. If you’re a big fan of scratch cards which build suspense – the type where you need to get 3 of the same symbols to win money – for example, betting $1 and scratching off two “$1000” symbols leaving you with just 1 $1000 symbol to hopefully scratch and reveal, then this isn’t the type of game for you. It’s a more simple version however Lucky 8 Scratch Cards do have their perks, in the form of a random progressive jackpot. The first thing you do is place your bet amount. You can wager from as low as $1 up to a maximum of $100 on each Lucky 8 Scratch Card. 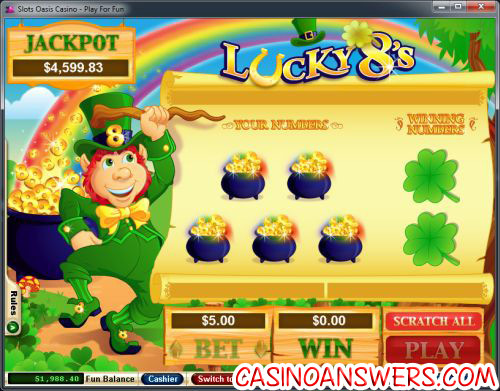 Upon choosing the amount of money that you wish to bet, click the “Play” option to activate the Lucky 8 Casino Scratch Card. There is actually no scratching involved in the Lucky 8 Scratch Card – just clicking. You click on what you want to reveal, and the symbols are instantly revealed. You can also choose to “reveal all” which will automatically reveal one symbol after the other. Head on over to Slots Oasis Casino to play the Lucky 8s Scratch Card. What scratch cards are online? What progressive jackpot scratch cards are there?